In January 2015 there was a storm in our area and a huge part of a Cedar of Lebanon tree came crashing down, you may recall me talking about it on this blog. At that time I showed you a dove that was made out of the wood and some of you were were eager to buy them once they were ready for sale. Well as you can see they are now available and all proceeds will go towards St. Marks Church Ampfield, Hampshire. From the tip of his nose to the end of his tail he is 3 1/2 inches wide and 2 1/2 inches tall. Each dove comes with a card stating its authenticity. The wood is very aromatic especially as it is newly cut. This Cedar of Lebanon tree stands outside the church where Revd Awdry who wrote the Thomas the Tank Engine book was baptised, he was born in the village and lived in the vicarage. He knew the church and the tree well as his father was Vicar of the parish, if you want to read about him look here. The doves are selling for 11.50 US dollars and postage 4.60 US dollars. Please e.mail me at popabobbinshuttle@gmail.com if you are interested in buying one. 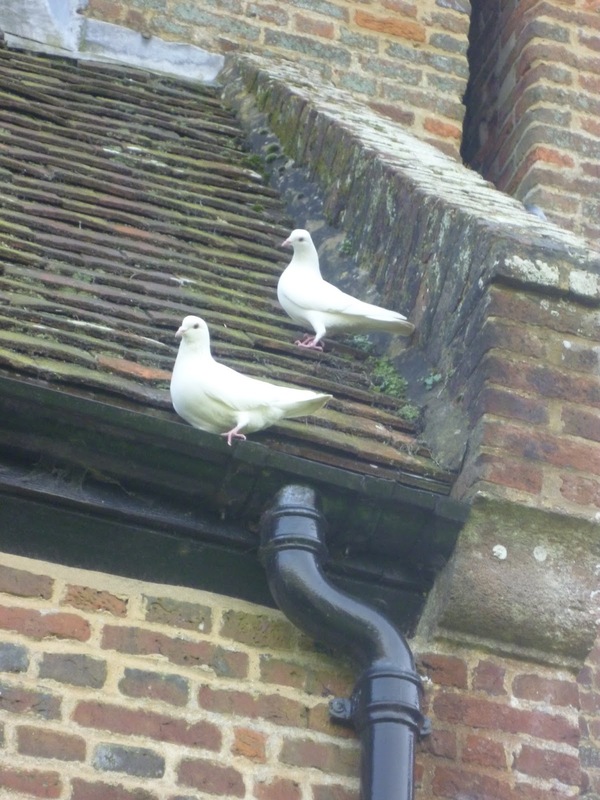 These two doves were playing on a church roof two weeks ago. 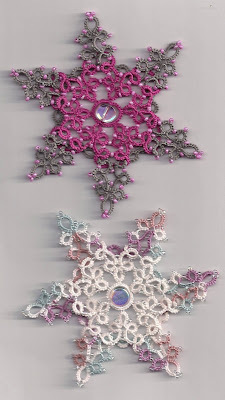 I have now stopped making Celtic snowflakes, reached 29 and could not go on any longer, just lost the will to do anymore. Instead started something else which is coming on nicely and will show you very soon. More pop-a-bobbin shuttles have been made and they are being oiled and then the next stage will be the testing, always a tense exercise! There has been a little break in production since 'im in the garage' started to make wooden lego men. I bought a skirt this week, so there is a possibility of actually making jewellery to match it. These are the threads and beads I found and the colours more or less match. 'Im in the garage has been trying to make shuttles that will take larger bobbins so that more thread can be wound on them. Unfortunately the trial did not go too well. The shuttle with the clear sewing machine bobbin (front of picture) works reasonably well and it will take a little extra thread. Whereas the industrial machine bobbin which Diane kindly sent me have proved very unsuccessful and the bobbin barely chucks along catching the wood most of the time. The main problem is that the bobbins are inflexible and together with the wood which of course is completely inflexible, the combination just doesn't work. The glueing of the broken Aero shuttles has been a minor success, with one operational, well I managed to fit a bobbin in, but now to scared to use it!